Action potentials probably existed in the first single-celled organisms, predating neuronal activity and the evolution of the nervous system, evolved for some other purpose, perhaps having to do with response to external chemical conditions. Some modern single-celled organisms can effect a kind of preneuronal electrical signaling and are capable of producing action potentials that regulate, for example, the direction of the beating of cilia and thus movement of the cell. Colonies of multicelled organisms that do not have a central nervous system, such as the cnidarian Obelia, may also produce action potentials. Obelia colonies share a digestive system, and electrical signals can spread through the common epithelial lining of the digestive cavity. Other cnidarians have nervous systems of a different sort. Hydra, for example, have nerve nets, collections of nonpolar neurons that send electrical impulses in any direction such that the whole body responds to any stimulus, although there can be a concentration of these nerves around the mouth for enhanced detection of food. There is no hierarchy of control, nor any specialization of neuronal function. The nerve nets also control the organism's movement (Matthews 2001) as well as acquisition of food. Echinoderms like starfish typically have a locally organized nervous system, with no central ganglion (see Figure 15-1). A ganglion is a knotlike cluster of nerve cells. The neurons of these radially symmetric organisms connect into a nerve ring, with branches extending into each of the five arms to innervate them. Jelly fishes have a neural net with ganglia, which allows some organization of movement such as swimming by pulsation. Wormlike hemichordates have a nerve net in the epidermis, which thickens to form several solid nerve cords, and a neurocord, a collection of giant nerve cells, which connects the nerve cords formed from the nerve net. 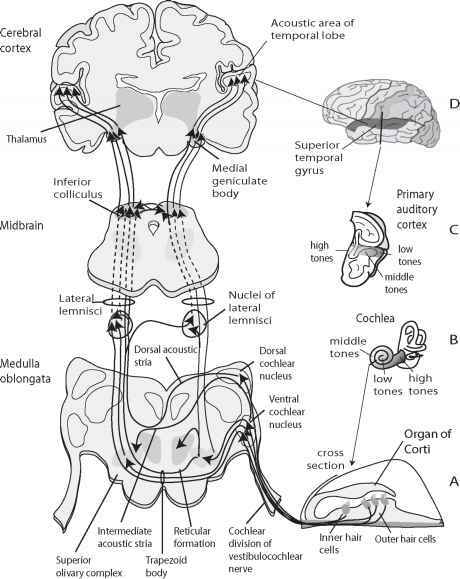 The neurocord probably plays a role in rapid motor responses (Butler and Hodos 1996). Flatworms have a collection of enlarged anterior ganglia, analogous to a simple brain. Longitudinal nerve cords allow for some control of body movements. Although insects have brains, their nervous systems are much less centralized than those of vertebrates. Generally, an insect CNS is organized into a series of ganglia, strung together along a commissure (a junction at which corresponding structures join), that runs along the ventral nerve cord, the latter being linked to the brain (see Figure 15-2A). The brain itself is a collection of six fused ganglia (three pairs) that each control specifically circumscribed activities. The first pair, the protocerebrum, innervates the compound eyes and the ocelli. The second, the deutocerebrum, integrates signals from the antennae. The third, the tritocerebrum, innervates the labrum (roof of the mouth) and integrates input from the proto-cerebrum and the deutocerebrum. It also links the brain to the rest of the ventral nerve cord and the ganglia along the cord that control other organs and behaviors, such as feeding, mating, locomotion, and sensory reception. As in the vertebrate CNS, there are three kinds of neurons in the insect nervous system: sensory afferents, motoneurons, and interneurons, nerve cells in the CNS that link the sensory and motoneurons. Figure 15-1. Organization of the nervous system. 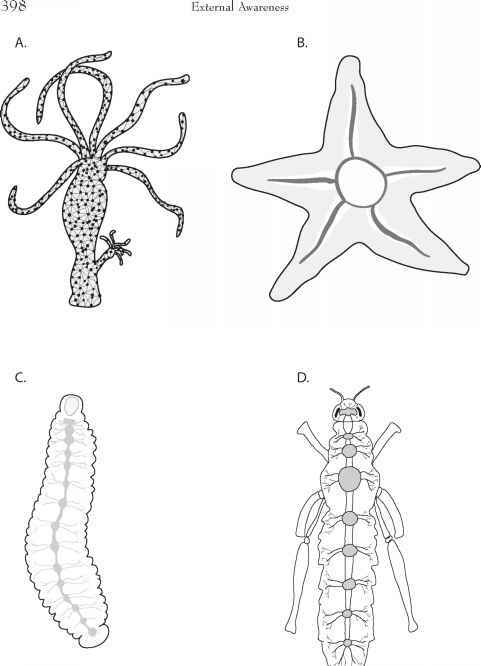 (A) The nerve net of the hydra; (B) the starfish nerve ring; (C) the leech ganglia and; (D) the cephalized nervous system of the grasshopper. Redrawn from (Matthews 2001).